Throughout life, you come across food items that immediately hold a special place in your heart. These are items you hold up on a pedestal, and any similar items, are immediately compared to these. Of course, the similar items are never nearly as good as those pedestal items. For me, the list of pedestal items seems to keep growing as I eat more and more. Just to name a few (in no order whatsoever…and really, this is just a few)…No Way Jose at Beaches & Cream; Veggie Sub at Penn Station East Coast Grilled Subs; Cheeseburger with Lettuce, Tomato, Pickles, Ketchup, Mayo, Mustard at Five Guys and the Enchiladas Supreme at Monte Alban. 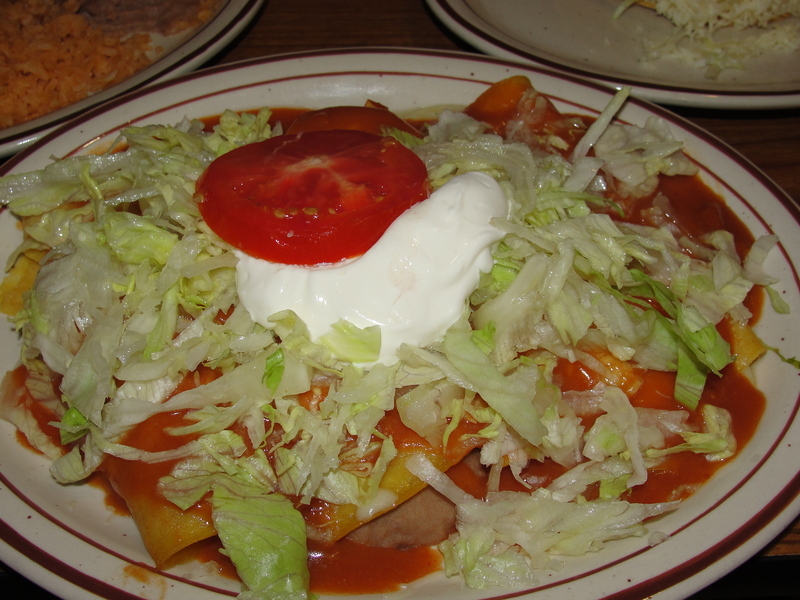 For whatever reason, the enchiladas at Monte Alban, in BVille, are simply my favorite. Everything about them is perfect. Well, a few months back a new Mexican Restaurant opened in BVille – El Manzanilio. While I was hesitant to try this and miss out on Monte Alban, we stopped in on our most recent trip. Well, I can say this will not be getting added to the Pedestal. My grandparents had visited this new joint a few times and enjoyed it. I mean, its Mexican Food. Even if it’s not great, it is normally good. We arrived to a mostly empty restaurant and were seated. Of course, the first thing to us was some baskets of chips. Myself, along with the rest of my family, dug right into the chips. 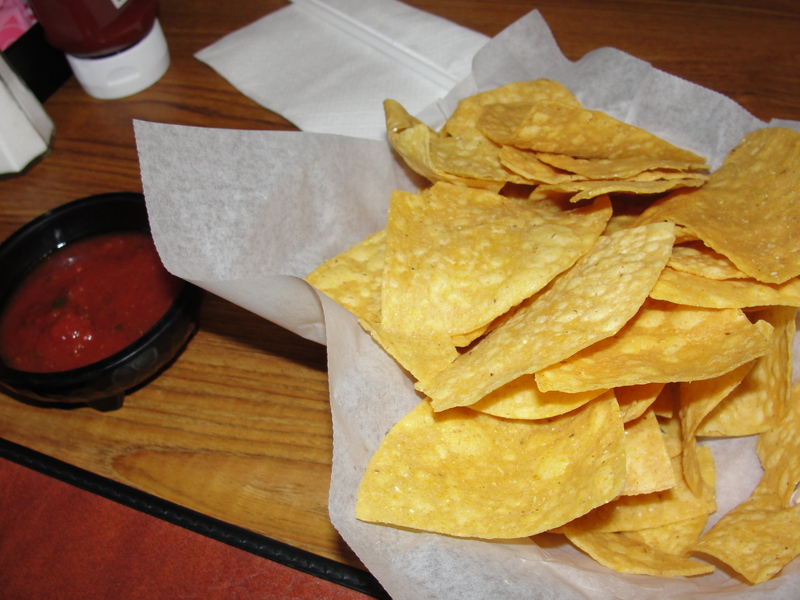 These were your typical Mexican restaurant chips – thin, hot, crispy & slightly salty. I could taste the slight corn taste within the chips and had no problem downing a good amount. I wasn’t a huge fan of the salsa they served but, that is really simply because I prefer pico to salsa. While there was nothing wrong with the salsa, the chunks & freshness of pico just wins in my book. We quickly finished our chips and munched on more throughout the meal. I knew, of course, that I would be ordering the Enchiladas Supreme – 1 beef, 1 chicken, 1 bean and 1 cheese enchilada. Served with a side of rice and beans. I also ordered 1 beef hard taco – a staple item at every Mexican location. After waiting 15 minutes or so, our food arrived. It did look good and I was ready to dig in. Let’s begin with the rice and beans. 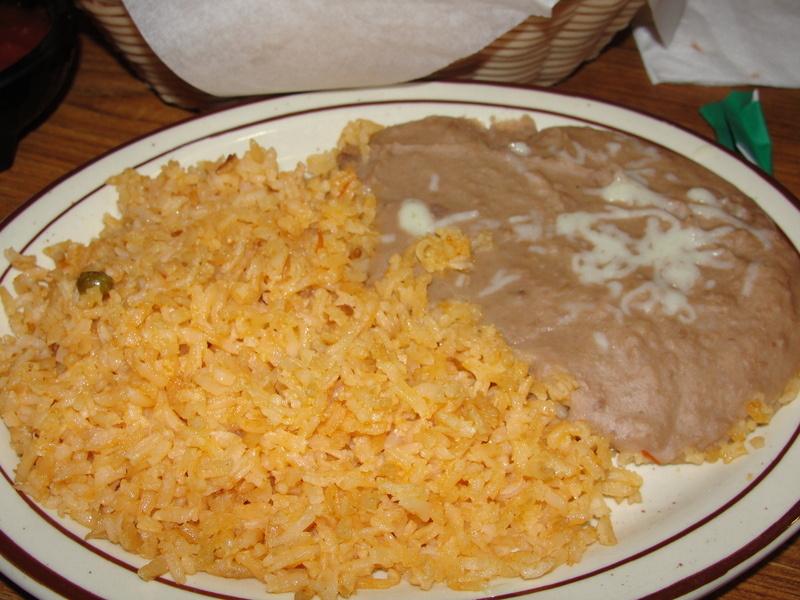 The beans were refried while the rice was typical Mexican rice. I found the consistency of the refried beans to be a little much…a bit too thick…like they were cooked in the morning and sat all day. The flavor of the beans was okay but, not great. As for the rice, it was simple and didn’t really have too many flavor qualities. Mixed together, the two were very thick and could have benefited from some pico. Overall, they were okay but, not something I would need to have again. Next up, let’s talk taco. The taco was really good. The shell was nice & crispy and the interior of the taco was plenty. While the ground beef was warm, juicy and flavorful, the cold toppings played nicely with it. Ample amounts of shredded lettuce & cheese topped this taco. I found the taco to be great from start to finish. Maybe not as good as Lozano’s Tacos (a Pedestal Item), but, certainly good. Good enough that I would indeed order again. And, as most tacos are, this one was pretty small. I finished it in about 5 bites and was left wanting more. Now, we move on to the main attraction – the enchiladas supreme. At first look, these did look promising. Each enchilada was wrapped in a corn tortilla and topped with some red sauce & lettuce with a tomato and sour cream in the center. I always eat the chicken and beef first because, I prefer the bean and cheese. This visit was no exception. I started with the chicken and beef and realized right away, these tortillas were store-bought. Now, I don’t expect every tortilla I eat to be homemade but, it makes such a difference. While these tortillas were store-bought, they lacked that just-made factor. Within the tortillas, both the chicken and beef were accompanied by some cheese. I found the chicken to be very dry and lacking in flavor. While the beef was the same ground beef as was in my taco, it did indeed have moist flavor. I found myself needing to use a lot of the sour cream in order to eat the chicken. Overall, the chicken was my least favorite and the beef was okay. When I started on the bean enchilada, I found the beans were the same as what was served in my rice and beans. Bad thing was, this made the enchilada dry & heavy. What probably would have ended up being really good, kind of got screwed with the sub-par beans. The cheese enchilada was just that – not too much to mess us here. It was nice and full of cheese and I ate it with ease. I cleared my enchilada plate, along with the toppings, even thought I didn’t love the chicken, beef or bean enchilada. The cheese enchilada was indeed the best of the 4. Also, I found the red sauce was somewhat lacking. This is usually the case for me…while I like most red sauces, there is just something about Monte Albans that makes it my favorite. I finished all of my food minus a few bites of the rice & beans. I did indeed leave the restaurant completely full. Overall, the meal was not bad. The service was good and the menu was plenty. In my mind, the enchiladas left a lot to be desired but, honestly, I say the same thing about pretty much all enchiladas other than Monte Alban. 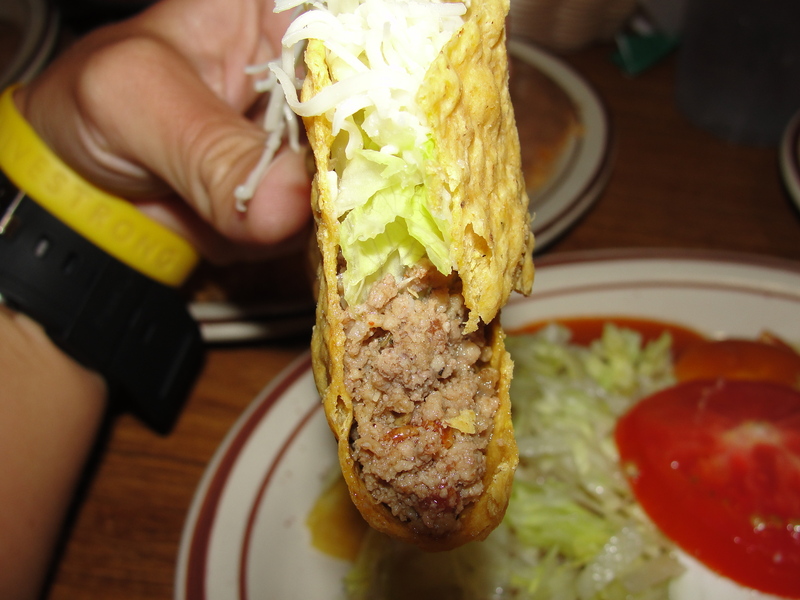 When I return, since I’m sure I will, I think I will stick with the tacos – they were crispy and tasty. I may give the rice and beans another go but, I will not be having the enchiladas supreme again. While this is one of my favorite items at a Mexican Restaurant, El Manzanilio just did not meet my expectations. I am sorry to say, El Manzanilio, there will be No Pedestal for You and your Enchiladas Supreme in my heart.